Book now to avoid missing out. This free experience of Tru-Cape’s Heritage Orchard is fast filling up. Click here to book. Heritage apple and pear varieties that are no longer in commercial production are being saved for future generations in the Tru-Cape Heritage Orchard on Oak Valley Estate, Elgin. For Tru-Cape, the largest exporter of South African apples and pears, protecting the genetics of nearly lost varieties is essential. Buks Nel, recently recognised by the SA Fruit Industry for his role in innovation following the discovery of FLASH GALA ™, says while his job is focused on new variety development, old varieties are also important. “If you don’t know where you’ve been you can’t know where you are going”, Nel says. Each year Tru-Cape opens the Heritage Orchard for two guided walkabouts but last year, because of the detrimental impact of the drought, the company thought it safer not to expose the orchard to the stress of visitors. “We are pleased to say the orchard will be open again in 2019 but only on Saturday, March 16 but for two sessions beginning at 10am and 2pm. “Although the orchard visits are free of charge we have to limit the number of people and so tickets have to be booked at Quicket and shown at the gate,” Nel says. People can expect to see, touch and taste older varieties such as Northern Spy, Pomme de Neige and many others. The tour is hosted by Tru-Cape’s Quality Assurance Manager, Henk Griessel and Buks Nel at Oak Valley Estate. According to Griessel and Nel who co-authored a book on historic apple varietals, “Apples in the early days at the Cape”, available for purchase at the open day and from Tru-Cape Fruit Marketing at R300 a copy, the Kroonappel will be one of the varieties available to taste. 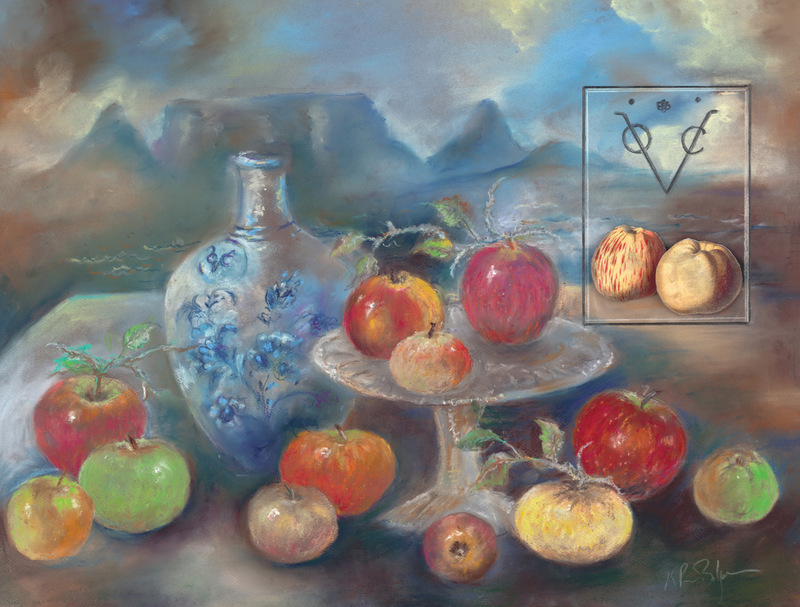 “Further investigation has shown that there were four Kroonappels, but it is most likely that the one around at the Cape in 1723 was the Kroon-Appel with the synonyms Fyne Kroon, Aagt-appel, Engelsche or Hollandsche Aagt or Lekker Beetje. This apple is from Holland. The Kroonappel’s fruit is described as of medium size, round, but sometimes lop-sided, the skin is smooth, colour is green-yellowish with pale red stripes. The flesh is soft, somewhat yellow with a very pleasant herby taste. It is said to be a good table apple. The tree is relatively large and bears well. Tracing the whereabouts of the Kroon-appel or Aagt (appel) was very interesting though extremely sketchy, based purely on personal communications and a few magazine snippets”, says Griessel. Please note that no seating, bathroom or refreshment facilities will be available in the orchard and people should consider sensible walking shoes and be sure to have appropriate weather and sun protection. In April 2019, Tru-Cape together with Hortgro, will replant the Witte Wijnappel – the first apple picked at the Cape, in its original home in The Company’s Gardens and thereafter also in the Tru-Cape Heritage Orchard. Make a reservation for lunch at The Pool Room restaurant on Oak Valley Estate, contact: 021 859 4111 or poolroom@oak-valley.co.za. Booking for the Tru-Cape Heritage Orchard Open Days via quicket.co.za or by clicking http://qkt.io/0GTcrI.